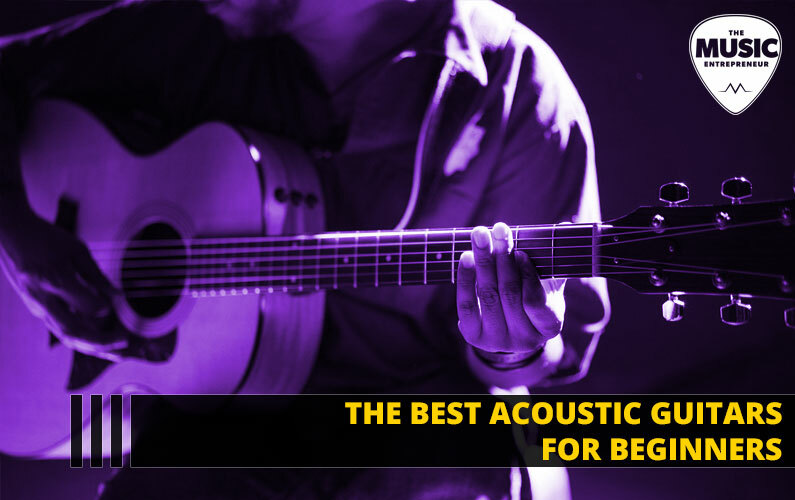 This guest post comes to us via Nadav Biran, who shares about some of the best beginner acoustic guitars on the market. If you think you’ve got the goods, you may also want to consider contributing to The Music Entrepreneur HQ. Note: This post contains affiliate links. If you purchase anything through these links, I will earn a small commission at no additional cost to you. Whether you want to learn guitar or you’ve already started, investing in your own guitar is something every beginner needs to consider. Guitars can be found in almost every store. The choices are endless, and finding a suitable acoustic guitar is important. The instrument could be accompanying you for years to come, after all. And it’s a big decision. The guitar you choose will probably be with you for a long time. I got my first guitar – a Yamaha C40 – when I was 12. And now, 15 years later, I still play it. Call me sentimental, but I may never get rid of that six-string. So, I hope this article helps you find the best acoustic guitar for you. Won’t Any Guitar Work Just Fine? Technically, you could go to your local pawn shop and pick out the first acoustic guitar you see. You could even learn on that guitar. But honestly, you don’t want to do that. There are characteristics of a guitar, like intonation (how it sounds as you move up the neck), action (the distance between the strings and the neck), and how well it holds a tune, that will affect how you learn. You don’t want to learn on an out-of-tune guitar or one that’s difficult to play because of the high action. So, yes, any guitar could work for a beginner. But how serious are you about learning guitar? When I went to buy my first guitar, I brought my uncle with me – a fantastic guitarist and an amateur luthier. He knew his stuff when it came to acoustic guitars, and he was super helpful when it came to choosing the right one. If possible, try to get a guitar from a physical music store. It’s best to play the instrument before you pay for it. So, if you have a friend or relative who’s an expert, or at least an experienced guitarist, ask if they’ll come with you to the guitar store. The reason for this is because every guitar – even those of the same make and model – is different. Guitars are often handmade, so they can be ever so slightly different. Maybe one Martin DCX1E has a slight buzz on the 11th fret while another one has slightly higher action. On the other hand, if you don’t have a music store in your area, you can always buy online. Now we can get down to the nitty-gritty of what guitars and models you should consider. These are the best acoustic guitars for beginners. This is the guitar I own, and I love it. It has a full, warm sound (something Martins are known for) and it stands up to temperature and humidity changes pretty well. The only reason it may not be one of your first choices is the price – it sits around the $600 mark. Many new guitarists don’t have that kind of money. Reliable (holds tune, does well with weather changes). Not as affordable as other guitars. This ¾ size guitar is a great one for beginners, especially for people who want to travel with it. It’s definitely a fun guitar to play and the intonation stays consistent. Good for people of smaller stature. Not as affordable as other guitars ($400 – 500). For about $300, the FG730 is a pretty good deal. It holds a nice tune and usually has decent intonation. However, some users have said that it’s too bright and “tinny,” rather than having a full and rich sound. Epiphone is a trusted name in the music world, and the Dove Pro is no exception. What’s cool about this guitar is that it’s acoustic-electric, meaning you can plug it into an amp or audio interface. Not always consistent constructions between models (that’s why you should play any guitar before you buy it). Like the Martin LX Little Martin, the Safari Supreme is a ¾ size guitar, making it great for children or someone who just prefers a smaller instrument. Plus, this one is very affordable, coming in at under $200. After travelling to several music shops with my uncle, I ended up buying a Takamine, my first purchased guitar. Takamines are generally decent guitars, although I didn’t properly care for mine and it developed cracks in the body. The G Series is another guitar worth looking at as a beginner. This is a very good deal – an acoustic guitar with a full-bodied sound for an affordable price (roughly $200 or so). The only downside is that it does not have is a cutaway for chords higher up on the neck. In my experience, Taylors usually have a brighter sound compared to other guitars, but the GS Mini offers a nice, full sound. It’s smaller than a standard guitar too, so it’s easy to carry around. The Alvarez Artist Series AD30 guitar is one of our top picks for beginners. It has a full and rich sound, and you can get one for under $300 – a nice balance of quality and affordability. Seagull makes nice guitars, and the S6 is our top pick as the best guitar for beginners. This is the ultimate mix of a great sounding guitar that’s also friendly on your wallet. Affordable (especially considering its high quality). Ultimately, choosing the right guitar comes down to how it feels to you. You have the final say, not some guitar reviewer. So, if you go to a music store, play every one of these guitars, and you’re having trouble deciding between a few, just let your fingers and ears tell you which to choose. You’ll be spending a lot of time with this new guitar, so let your knowledge and your gut instinct work together to make the choice. Ask yourself: how does the guitar feel in my arms and in my ears? That’s what matters most! Nadav Biran is a music producer/audio engineer and the co-founder of catzaudio.com, a pro audio magazine focused on providing music producers with the latest pro audio news, reviews, interviews, and guides.